This Flan Cake is the famous Brazilian Pudim Cake. And it’s one of my favorite desserts. Taste wise, it’s phenomenal, unbeatable. 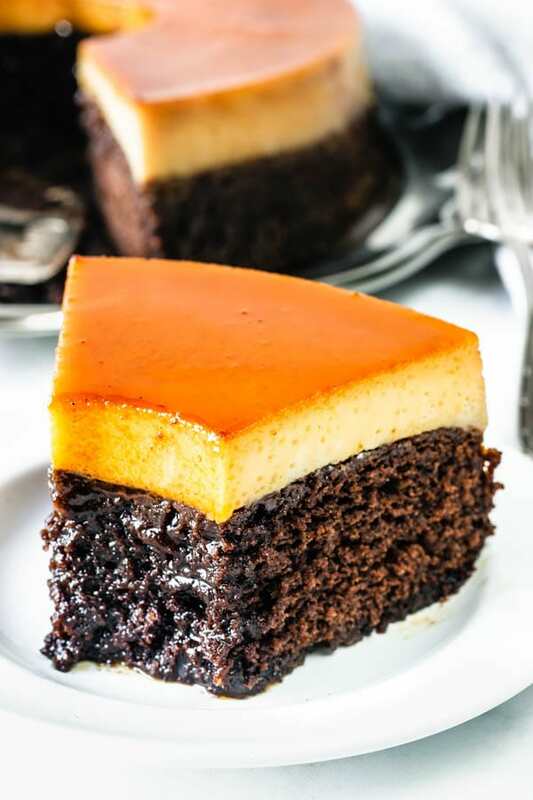 A very moist chocolate cake under a silky flan, and don’t forget about the sticky caramel layer on top. This is the type of dessert that you bring to a celebration, maybe an end of the year party. Impress your guests with this marvelous dessert, scrumptious treat! I am positive everyone will love you for it. 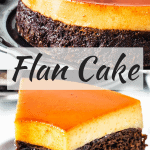 And the best thing, this Flan Cake is totally super easy to make! Just follow my instructions and tips bellow! 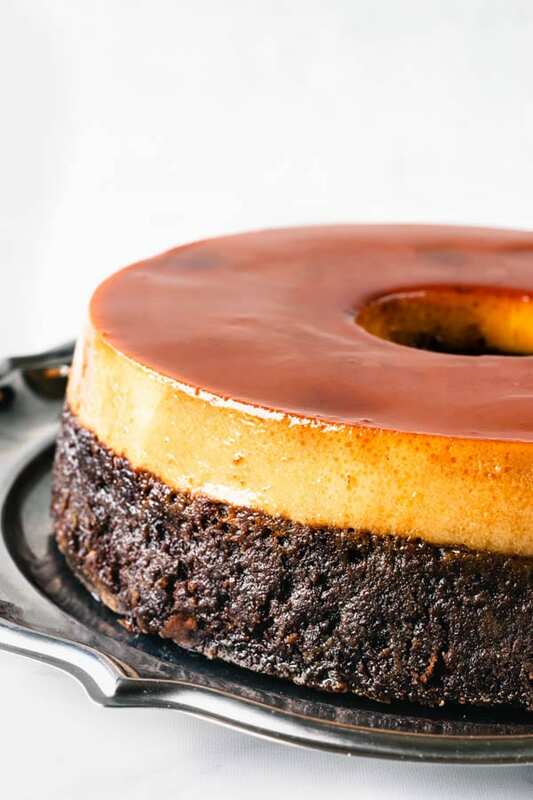 This Flan Cake is also known as Chocoflan in Latin America. And it’s extremely popular because of being so delicious. 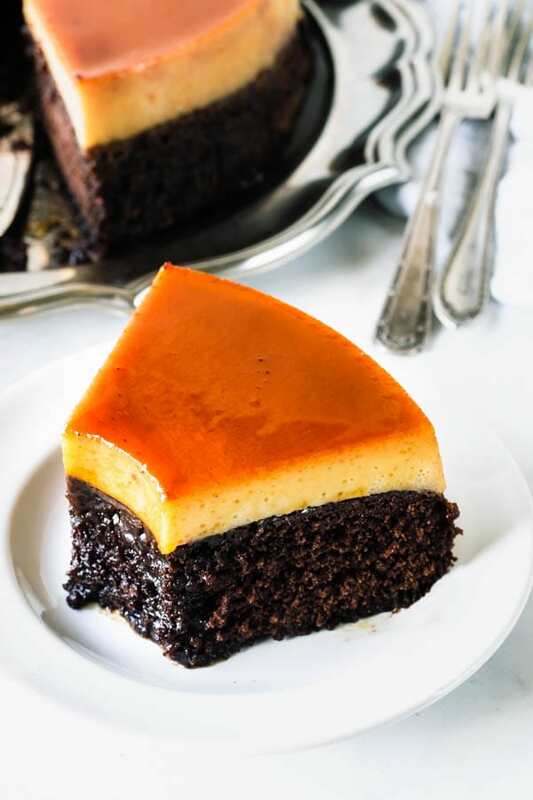 Flan Cake is also usually known as Magic Cake, or even Impossible Cake. And that’s because the batters invert as you bake the cake. You pour the chocolate cake batter on the bottom of the pan, and it will rise to the top of the pan as it bakes. And finally, it will end up in the bottom of the final cake once you flip it upside down onto a plate. Therefore… Impossible Cake, or Magic Cake! 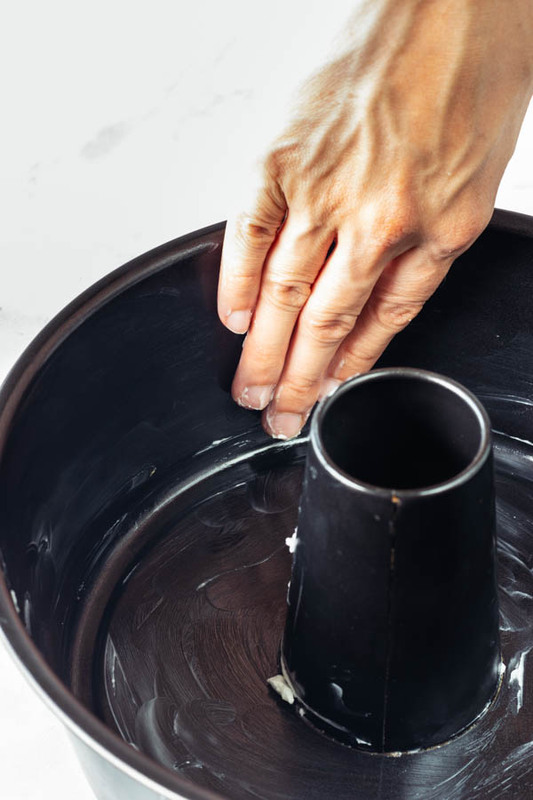 Grease your Bundt pan with some vegetable shortening, and then sprinkle granulated sugar all over it, and tap the pan over the sink to shake off the excess sugar. To make the caramel, simply melt the sugar in a pan with a heavy bottom, over medium heat, ALWAYS stirring. This way, the sugar will melt evenly. Once the sugar has melted and browned slightly, remove the pan from the heat and add water to it. The mixture will crystalize. You have to bring it back to the heat, and melt the sugar again. Always stirring. Let the syrup cool down until it’s room temperature. Then, pour cooled mixture over greased and sugared bundt pan. And now, place the pan in the freezer while you make the cake. This way, the caramel will have hardened and won’t mix with the batter when you add that later. Now here’s the biggest trick. You add the chocolate cake to the bottom of the pan, directly on top of the hardened caramel. And you pour the flan on top of the cake. Sounds crazy, but trust me, it works! 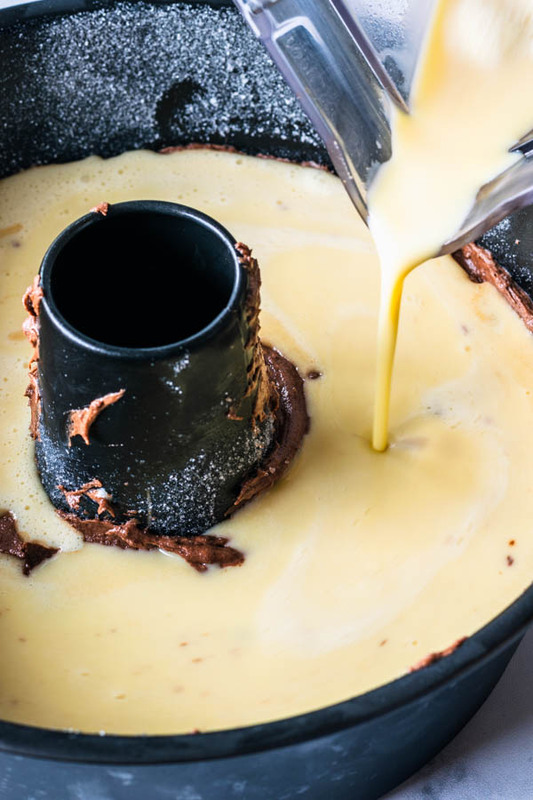 The flan batter will go to the bottom of the pan, and the cake batter will float to the top. And your cake will bake exactly like the pictures. To bake the flan cake, use a water bath. I usually use a large turkey roasting pan (this is a cheap pan I use exclusively for my water baths, for cheesecake and etc). But any large pan will do, as long as you are able to add water to it, up to the middle of the height of the bundt pan. 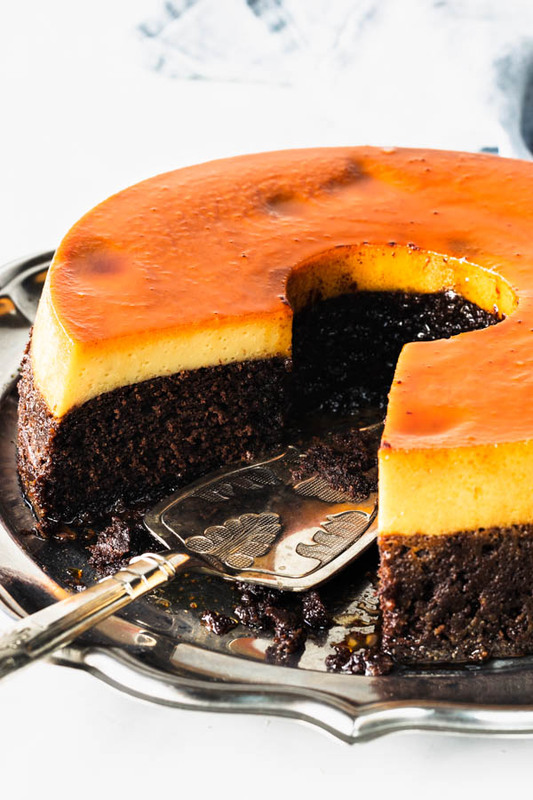 After baking your Flan Cake, let it cool down. Then transfer the bundt pan to the fridge, where you will let your Flan Cake rest for at least 6 hours, preferably overnight. Now, use the same pan where you had your water bath in. Pour some hot water in that pan, and place the bundt pan over the hot water. This will help the caramel loosen from the bottom by melting it slightly. Give the bundt pan a little jiggle, and if the cake jiggles around, you are good to go. Otherwise, place it back over the hot water. 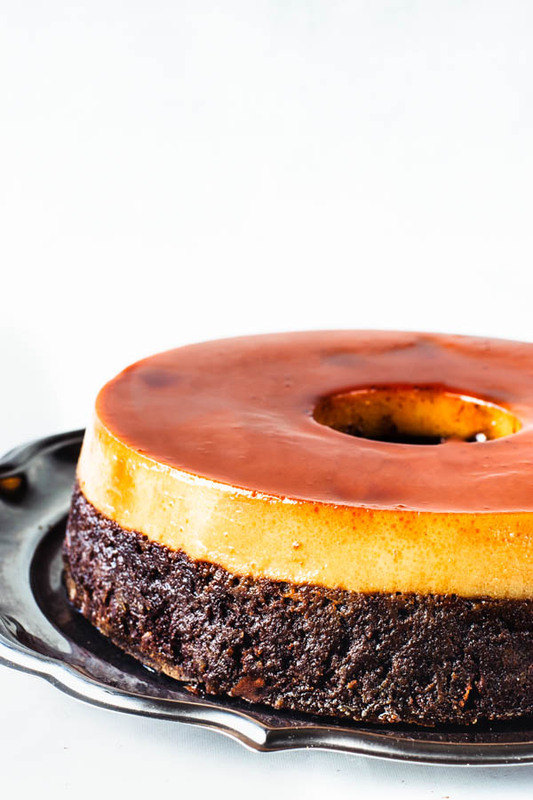 And now you are ready to turn this Flan Cake into a plate. I have a feeling everyone around you will adore you for making this. And as you can see above, this is not a difficult recipe at all. I ended up sharing my flan cake with my neighbors, and with some friends. But that was after I had a huge delicious slice. Since I make lots of desserts, I try not to eat too much of them. Sometimes I’ll just taste test. However, I did save some space in my stomach for a big slice of this one, since it’s a recipe that lives so close to my heart. Because it is a Brazilian recipe, and one of the first things I’ve ever baked years and years ago when I was about 17 years old. I mean, I’m not using that same recipe, since I don’t have it anymore. So I had to go search for another recipe. 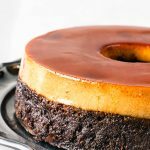 So it doesn’t matter if you know it as Chocoflan, Pudim Cake, Impossible Cake, Magic Cake, or Flan Cake (so many names!!!) you will LOVE this decadent dessert! Trending recipes at the moment: Lemon Macarons, Raspberry Macarons. Recipes to make for the Holiday Celebrations: Pecan Fig Cake, Short Ribs Pie, Cashew Caramel Babka. What I am craving for today: Cannoli. The base of the cake is chocolate. 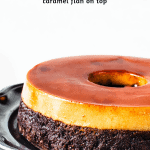 On top, a layer of caramel flan. Impossible to resist. 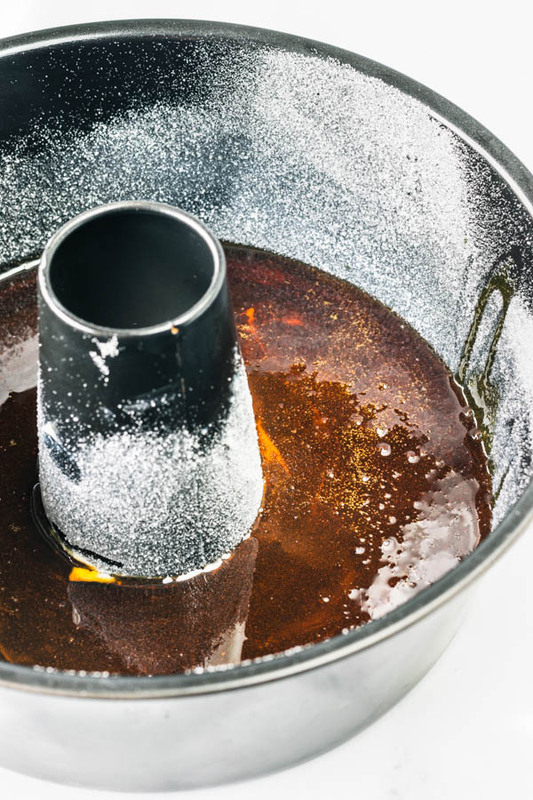 To make the caramel, start by melting sugar in a small pan over medium heat. Make sure to use a pan with a heavy bottom so your caramel doesn’t start burning in some spots that might get too hot. Never stop stirring the sugar as it melts. Because you want it to melt evenly. Once all the sugar has melted, your syrup will probably be slightly browned. When your syrup is smooth, with no sugar granules or lumps, you are going to take the pan out of the heat. Now, be careful with this next step. You are going to pour the 1/2 cup of water over the melted sugar. It will probably splash, so you need to be careful and maintain your distance, as well as make sure to do this slowly. Once you’ve poured the water over the caramel syrup, you will notice that the caramel will have hardened up. Bring mixture back to the heat, and keep stirring with your spatula until all the sugar has re-melted. Once the syrup is smooth and with a deep amber color, you can remove from the oven. It’s supposed to be a very thin and light syrup. You can make it into a thicker syrup by boiling the mixture for a few more minutes. I just find it works better for the flan to have a slightly thinner caramel, since it will keep cooking in the oven later on. Remove caramel to a heat-safe container. Let it cool to room temperature. 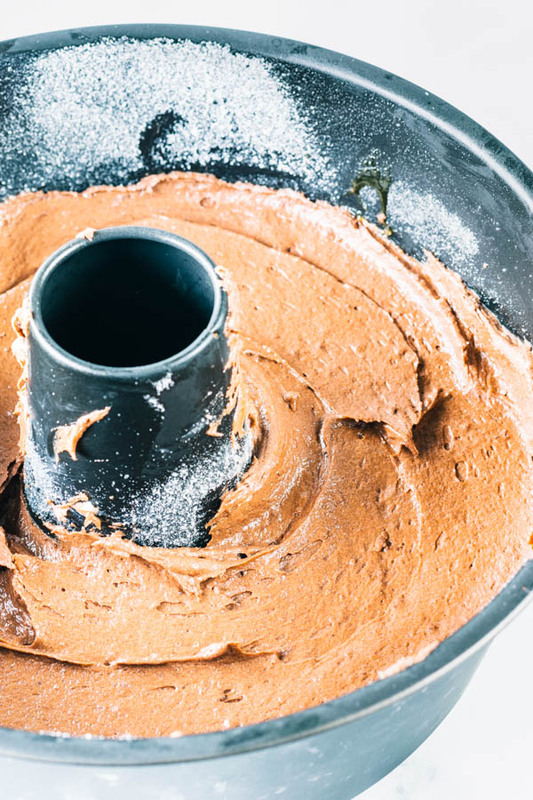 Grease a bundt pan thoroughly with vegetable shortening. Sprinkle granulated sugar all over it. Tap pan over the sink to remove excess sugar. Pour cooled caramel on the bottom of greased bundt pan. Insert it in the freezer while you make the cake and the flan. You want the caramel layer to be hard when you pour the cake batter in the pan, because otherwise the caramel is just going to mix with the ingredients of the batter. Start by sifting the dry ingredients together: flour, salt, baking powder, and cocoa powder. Set aside. Add sugar, cream both together for about 1 minute until the mixture is fluffy and pale in color. Add eggs one at a time, waiting to incorporate one egg before adding the next one. Add milk. Mix to combine. Now you are going to add the sifted dry ingredients to the bowl. Be careful not to overmix. Just stir until there are no more dry ingredients in the batter. If the mixture is lumpy, you can use a whisk to help smooth it out, but again, don’t overmix anything! Slightly beat the eggs before adding all of the other ingredients to the batter. That prevents any egg “lumps” that might form. In a blender, mix beaten eggs, condensed milk, heavy cream, vanilla, and flour. Blend mix on high for 1-2 minutes, depending on the potency of your blender. You are looking for a smooth thin and runny batter. Pour chocolate mixture over chilled and hardened caramel layer in the bundt pan. Use a spatula to smooth out the top of the chocolate cake batter. 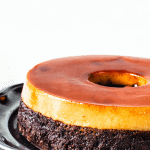 Pour flan batter over chocolate cake, slowly and carefully. Now place cake in the oven, over a water bath. Cover the bundt pan tight with foil. And bake for 1 hour-1 1/2 hours. For my water bath I use a large turkey roasting pan, works with my cheesecake pans too. Make sure you use hot water in your water bath, fill it up to the middle of the height of the bundt pan. Make sure to check your flan around the 60 minute mark. Just insert a toothpick in the cake to make sure it comes out clean, which means it’s done baking. If not, keep baking. At the last 10 minutes you may also remove the aluminum foil that’s covering your pan. Let flan cool down, place it in the fridge for 6 hours or overnight. When you are ready to remove the flan from the pan, just fill up a large pan with some hot water, place the bundt pan in the water bath, so this way it will help loosen up the caramel that’s on the bottom of the bundt pan, for easy removal. If you skip this step, your cake might not come out of the pan, or what’s even worse, it might break. Store it in your fridge, covered, for up to 5 days. This is like magic cake/flan! As always you have the best pictures, the best tips, and the most droo lworthy recipe. I do not want to wait for a special occasion to make this. I need to have it now. its look so yummy… now im baking this recipe.. wish its turn as good as yours.. thanks alot for your posting.. Ohhh!! That’s so exciting! Let me know how it turned out!! Thank you so much!! Have you figured out the proportions for a thicker layer of flan? If you have, could you please post them? If you have not tried that yet, can I just double the fan recipe? If I do that, do you have any suggestions about how much additional cooking time will be needed without drying out the cake part of the dish? I haven’t tried yet but I want to try making 1 1/2 recipe for the flan next time, and as far as baking time goes, might affect it by a few minutes, but not by much I assume. Thank you for your answer. I will play around with it and see what happens. Yes!! let me know if you do please!! Id love to hear!! Planning to make this soon!! I am wondering if I were to add chocolate chips to the cake layer if it would still rise to the top. Do you have any thoughts on this? That’s an interesting question but I am assuming it would be at the bottom with the cake, but I can’t guarantee it since I haven’t tried it. It’s worth the try, I mean it will probably be delicious!!!!! Thank you so much! I just made this for dessert tonight and when I turned it out, the flan layer feels pretty firm. Is this normal? Should I set it out at room temperature so it becomes less cold or is straight from the fridge the way to eat it? I usually eat it straight from the fridge. It’s supposed to be firm but not suuuper firm. At room temperature will become a bit softer. Have you tried making this in a pan other than a bundt? I want to make this today, but I only have an old school bundt pan with the grooves. So excited to try it, thanks for the amazing recipe!! I have never tried making this in another pan, but as long as you grease it well, it should be fine. Maybe the cooking time will vary, just keep an eye out for the signs that the bundt is baked, insert a toothpick in the cake and if it comes out clean, means it’s probably done. also poke the top of the cake with your finger gently and if it springs back, means the cake is done. Hope you enjoy it! Thanks for writing! I made this last night in this bundt pan https://www.williams-sonoma.com/m/products/heritage-bundt-cake-pan/?cm_cat=Google&sku=5519244&catalogId=60&cm_ite=5519244&gclid=CjwKCAiAv9riBRANEiwA9Dqv1eKPJ5JFlaf32d6MZwOnTOgqz85WsuKNLcnk5Z41UQizjmh2JusQkxoCStMQAvD_BwE&cm_ven=PLA&cm_pla=Bakeware%20%3e%20Cake%20Pans%20%3e%20Bundt(R)%20Cake%20Pans and it came out great. Beautiful and delicious. I also substituted a combo of coffee and kahlua instead of the cup of milk and the flavor was amazing!! Ohhhh the coffee and Kahlua combo sounds amazing!! nice one! Thank you so much for making my recipe!! I bet your cake was fantastic!!! I will jot this down about the coffee and kahlua combo! !